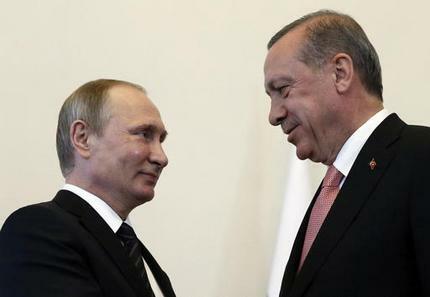 ST. PETERSBURG, Russia (AP) -- On his first foreign visit after Turkey's failed coup, Turkish President Recep Tayyip Erdogan thanked Russian President Vladimir Putin for inviting him for talks Tuesday aimed at repairing ties shattered by Turkey's downing of a Russian warplane along the Syrian border last year. The downing of the Russian jet in November, which Putin described as a "treacherous stab in the back," came amid boiling tensions over Syria, where Moscow and Ankara back opposing sides in the war. Russia promptly cut ties with Turkey over the incident, banned Turkish vegetables, restricted Russian tourists' access to Turkey and blocked some Turkish companies from working on its market. Erdogan in June sent a letter to Putin with a long-anticipated apology for Turkey's downing of the jet, setting the scene for the meeting Tuesday at Konstantin Palace in St. Petersburg. Opening the talks, Putin said he was "glad" to be seeing Erdogan again and praised his visit as Turkey's commitment to repair the soured ties. "Your visit means that all of us want the dialogue to be resumed," Putin said. Putin is interested in mending the rift with Turkey in the hopes of reviving key economic projects, including a much-touted pipeline to carry natural gas to Turkey, and expanding Russia's clout in Syria. Both leaders looked composed and not overly emotional when they met and shook hands for a picture. Erdogan, in his opening remarks, thanked Putin twice for inviting him to Russia and said the cooperation between the two countries should benefit the entire region. Analysts say that Erdogan, with the visit, may also be hoping to play the Russian card to strengthen his hand in disputes with the United States and European Union. Turkey is pressing the United States hard to extradite Turkish cleric Fethullah Gulen, whom the government blames for the failed July 15 coup. Gulen denies the claims. 0 Response to "TURKEY'S ERDOGAN SITS DOWN WITH RUSSIA'S PUTIN FOR TALKS"